I am sure by now you have heard and seen the back-to-school commercials. Or if you have school-age children, you have probably been out shopping for new back-to-school clothes and other supplies. But have you thought of your business fall needs? Many of the same supply stores where parents are shopping for school items are the same places that many companies look to for office supplies. If you look at the deals they are offering, many of the products they have on sale are the same products most of us use on a daily basis in our office space. So why not take advantage of these end-of-summer sales for your business too? While office business centres like Telsec do not have end-of-summer sales, we often get a great deal of inquires from businesses looking to rent office space at the end of summer. This is partly due to the mindset of small business owners that with their kids going back to school, it is time for them to get back to work without the benefit of long weekends and holidays. This is also because many home-based business owners begin to realize that even with the kids in school, they need to work from an office that provides them with not only a prestigious business address, but also a professional working atmosphere. Businesses of all sizes are changing in what types of office space arrangements they are looking for. Not as many businesses are looking at tradition raw office space, but they are looking at offices where they can be flexible with the number of employees they have in the office – and how many they can have working remotely even if it’s only a few days a week. Not needing a dedicated desk for every employee, or not paying for unused boardrooms or meeting rooms, are just some of the reasons why businesses are taking a serious look at office business centres and the many inexpensive services they provide. They are also looking at the infrastructure costs that come with raw office space and realizing that the cost of owning or leasing office equipment like a telephone system or photocopiers are capital costs that tie up funds they could be using to promote and grow their businesses. Again, while Telsec may not have any “Back To School” sales or introductory offers, our staff are willing to compete with written quotes from any other business centres. Our prices are no secret and we do not have any hidden fees – so call us today to arrange a tour. 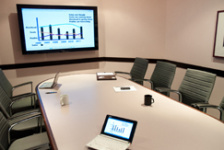 Boardrooms Matter– and so do Boardroom Manners!